Every morning, the fine folks at Sports Radio Interviews sift through the a.m. drive-time chatter to bring you the best interviews with coaches, players, and personalities across the sports landscape. Today: Brett Favre reflects on Brett Favre's career. Favre joined 790 The Zone in Atlanta with Mike (Favre's fellow broadcaster this weekend) and Hans to talk about how he's been enjoying retired life so far, his time in Minnesota, why he doesn't regret coming back for those two years, how his career turned out to be even better than his wildest of dreams and aspirations, Aaron Rodgers leading the Packers to the Super Bowl last season, being surprised that Rodgers didn't do so sooner, and the state of the passing game in today's NFL. "I am, which I guess tells me that it was time. Do I miss the game? Sure I do. I miss the guys, I miss the competitive, I don't know if you would call it—edge or spirit or whatever the term may be, I miss that every week. I don't miss the between the games during the week; it got very monotonous for me. I also don't miss the stress to perform at a high level week in and week out, because that just became so draining. And I know it's impossible to perform at the top tier week in and week out. I know I was fortunate to do that for the better part of my career. So there's nothing to look back and say ‘boy, if I had just done this or I had just done that.' I'd be a fool if I didn't think I'd miss the camaraderie, being with the guys—there's nothing like being in that locker room after a great win,a hard-fought win, or bouncing back from a tough loss the following week, there's nothing like that, there's no way I can replace that feeling. But, I'll be 42 next week, I've got a grandson, I've got two beautiful daughters, the youngest daughter is playing basketball. I enjoy working out here on my property. So there's a lot to keep me occupied. That's not to say one day I'll become bored. We all become bored at some point with whatever we do. But I've got this philosophy right now to kind of just take everything as it comes, don't get hurried, there's no reason to [just] enjoy life." "Well you know what, Mike? I won't lie to you, there has been times, not anymore, but there has been times once that season started—numerous times—that I thought I shouldn't have played; this was a mistake. But then after the season was over, and maybe even before—I think the last couple of games which I didn't play in, and it'd been years since I hadn't played and watched from the sidelines, better yet in street clothes, that was the first time I'd ever done that – but it gave me a chance to really reflect and look around. There was no pressure to perform. I was just kind of watching. So I had a chance to really think and think in depth. And to be honest with you, I didn't regret coming back at that point. There were times during the season, prior to those games, where I did... So if I needed an exclamation point on my career, two years ago would have been a great time to walk away. I don't think anyone wouldn't have been able to say ‘Hey, the guy's got something left in his tank, he probably could have played another year.' Well, you know, we know now. If anything this past year was the answer that I'd been looking for." "You know, I have to agree with Jerry. 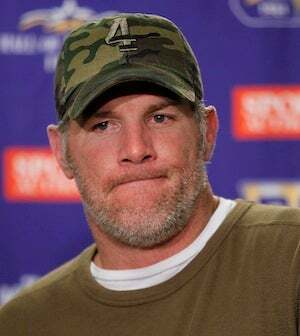 And at the time, no one including Brett Favre would have thought my career would have ended up the way he did. As a young boy, I was no different, maybe even more dreams and aspirations than the normal Joe. My goals were pretty high. But I have to be honest, they were not as high as they ended up being. So actually, I'm one of the few people who can say that my actual career and performance were greater than my dreams had been. So man, I just find it hard to believe that it could have been any better, more likely not as good, had I stayed in Atlanta." "It was disappointing to never win one game, but as you're playing it's always ‘next year' or ‘this year', ‘this is the year.' So, once it's over you go, well that wasn't the case. Yeah, we came close several times after, went to the Super Bowl the following year. You know, it is hard to repeat, but then again it's not. A lot of factors have to play into it - obviously health from an overall team standpoint is important, the nucleus of the team coming back is important... and I think most importantly, do you still [play] with the same passion and hunger that you did prior to winning the Super Bowl. If you have those in place, you have a pretty good shot. So it was disappointing to never go back aside from that following year, although we were close. But my career is very, very rewarding to me. So I have no regrets, and really the [disappointment] I feel at times is very normal, if any. Because again, I think about those dreams I had as a kid, and to think I'm sitting here now and I've far exceeded those dreams is quite an accomplishment." "I'm going to be honest, I was not surprised. The biggest surprise to me would be that he didn't do it sooner. It's funny how people can get over time, my last year in Green Bay prior to the first game, I made the remark that this was probably the most talented team that I've ever played on. And of course everyone looked up and was like ‘This guy's off his rocker.' We were very, very young; take me out of the mix and we were by far the youngest team in the league. But I could see the talent pool across the board was outstanding. Now our season kind of ended up being a reflection of that. We came close, and I think we took a lot of people by surprise, but guys emerged rather quickly. Aaron had a chance…even though the last couple years it's seemed like he's almost a rookie, he's been around awhile. And I'd like to think that he watched, he learned, and then when he got a chance to play, he brought in his ability—which is obviously very good or they wouldn't have drafted him in the first round. He's got tremendous talent, he's very bright and he got a chance to watch and see successful teams do it right. And so he just kind of fell into a good situation. On top of that, he's a good player. I don't think there's any pressure on him now, the talent around him is even better than when I was there. So I'm really kind of surprised it took him so long. In the early part of last year season, it hadn't quite clicked yet and I didn't know it would. I just kind of figured when they hit their stride, they're going to be hard to beat. And that's what happened." This post, written by Michael Bean, appears courtesy of Sports Radio Interviews. For the complete highlights of the interview, as well as audio, click here. • Jerry Jones says he and Tony Romo have no beef. • Chuck Neinas does not want to talk about the number nine. • Steve Smith talks about keeping his mouth closed.